Sauce Labs provides a secure and scalable cloud computing platform for functional testing of web and mobile apps located in world-class data centers in North America and Europe. Having our own cloud enables us to provide our services faster, and with higher security, than can be delivered on a public cloud with shared resources. Managing our own data centers also means that we are responsible for delivering a consistent experience with the utmost concern for the security of our users’ data. 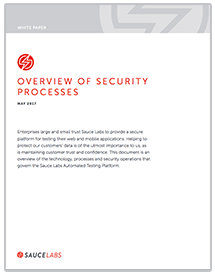 This white paper provides an overview of the services offered by Sauce Labs, an explanation of how we secure the transmission of test data and results, and our security policies and procedures.